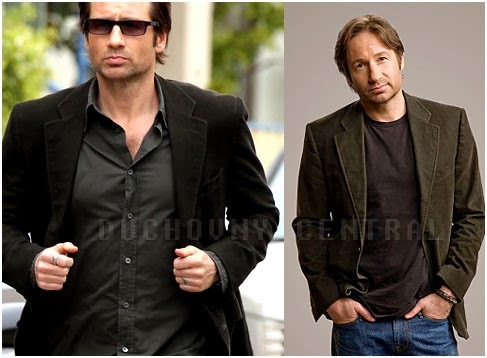 (From left to right) Image from Hank Moody in Season 3. We confirmed that Hank is dressed with Yves Saint Laurent sports coat/jacket. (It's not showed here but during the series if you pay close attention. There was a glimpse of the sports coat's inside pocket and it is visible the logo of YSL: Yves Saint Laurent). The last but not the least: Men's Stylish Long Sleeve Peaked Lapel Solid Color Pockets Front Blazer. Available in black It costs less! and althought is clearly not the same model from YSL, it is worth a try if you want to get a formal and casual look at the same time.